Shiny Pokemon are one of the series' most beloved secrets. These hard-to-find Pokemon with alternate color schemes - a Ponyta with blue flames or a Charizard with black scales, for example - are a collector's dream, and every time a new Pokemon game comes out, players poke and prod to find the best method for capturing them. Just a few days after its release, aspiring trainers have found Pokemon Sun and Moon's method. It's called "ally chaining," and takes advantage of a new system introduced in Sun and Moon: the ability for wild pokemon to call for help. While the chances of a Pokemon calling for help are random, you can increase the odds of it happening with a single-use item called an Adrenaline Orb. 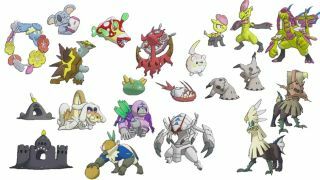 If you're going shiny hunting, you'll want to stock up on these, along with potions, revives, elixirs, and ethers. Now that you're stocked up and ready to go, get into battle with the Pokemon that you want the shiny form of, use the Adrenaline Orb, and keep your foe alive until it calls for help. Once there are two Pokemon, you can safely KO one of them (it doesn't matter which) and repeat the process. Each call for help increases the chances of the next ally Pokemon summoned into battle being a shiny, so the longer you keep at it, the better your odds. You only need to use the Adrenaline Orb once, and even if the Pokemon calling for help summons a Pokemon of a different species, your chain will remain unbroken. Reddit user Sprongz points out that this method also works for trainers who are hunting for Pokemon with strong IV and EV values. What's IV value and an EV value, you ask? Hoo boy. Let's just stick with how to find a pretty Alolan Vulpix for now and save that for another time.